An Egyptian biochemist held for questioning over the London bomb attacks has no links to al-Qaeda, Egypt's interior minister has said. Habib al-Adli told Egyptian newspaper Al-Jumhuriyah media speculation about Magdi Mahmoud al-Nashar was groundless. He also denied agents of the British security services had participated in Mr al-Nashar's interrogation in Cairo. 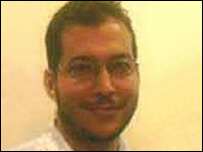 Unofficial sources in Cairo and London say British agents are observing the 33-year-old's ongoing interrogation. The Egyptians are doing everything possible to cooperate, the sources say. Mr al-Adli told Al-Jumhuriyah that reports elsewhere in the British and Arab media linking Mr al-Nashar to al-Qaeda were "groundless" and based on a hasty conclusion. The ministry on Friday released an extract from the interrogation in which Mr al-Nashar denied having any role in the attacks. He had told investigators he was on holiday, all his belongings remained in the UK and he planned to return there, the ministry said in a statement. British police are searching a house in Leeds linked to Mr al-Nashar. They have turned their attention to finding those who may have helped the bombers carry out last Thursday's attacks - in which 55 people died, including three bombers. They know three of the bombers were from West Yorkshire - Hussain, 18, of Holbeck, Leeds; Shehzad Tanweer, 22, of Beeston, Leeds, and Mohammad Sidique Khan, 30, of Dewsbury - and are searching their homes. They are also searching the home of the fourth bomber, Germaine Lindsay, a Jamaican-born man who lived in Aylesbury, Buckinghamshire. Meanwhile Britain's top Muslims have branded the London suicide bombings "utterly criminal, totally reprehensible, and absolutely un-Islamic". A joint statement of condemnation came as 22 leaders and scholars met at the Islamic Cultural Centre, in London. Muslim leaders said there could never be any excuse for taking an innocent life, it said. The statement said everyone must confront the problems of Islamophobia, racism, unemployment, economic deprivation and social exclusion. Of the Muslim stance on suicide bombing, the leaders said: "There can never be any excuse for taking an innocent life. "The Koran clearly declares that killing an innocent person was tantamount to killing all mankind and likewise saving a single life was as if one had saved the life of all mankind. Those who carried out the bombing, the statement said, "should in no sense be regarded as martyrs". Both Muslims and non-Muslims should help bring the people behind the bombing to justice, it said. "The pursuit of justice for the victims of last week's attacks is an obligation under the faith of Islam." But Britain's highest ranking Asian police officer, Tarique Ghaffur, says Muslims and their leaders must do more than just condemn the bombings. In his only interview on the attacks, Mr Ghaffur, the Metropolitan Police Assistant Commissioner, urged Muslims and their leaders to inform on potential terrorists and their supporters. The police would protect informers, using the lessons learned from tackling serious and organised crime, the head of the Met's serious crimes directorate added. They would have to engage better with minorities - but the minorities would have to take the first step, he said. An air of radicalism had been building up among a minority of Muslims, Mr Ghaffur added. Mohammad Sidique Khan's family say they believe the Circle Line bomber could have been "brainwashed" by terrorists. The family of 18-year-old London bomber Hasib Mir Hussain said they were "devastated" at his involvement.